If you’ve been wondering why the long silence, trust me, it’s all because of this robot hand. 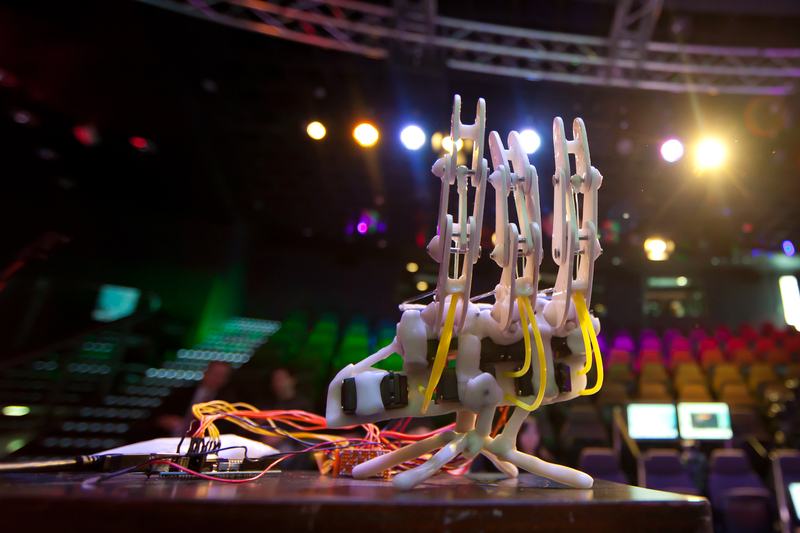 Ok, so a robotic hand isn’t that small a thing, especially when it’s taken decades to make. But it was pretty cool when the guys from Make.Hack.Void showed up to Robot World Live! to demonstrate it, and wowed me with what you can do at home by way of personal projects. Did you know that out there in the world right now there are places called Hacker Spaces? In which you can find tech/ art/ design/ science people and make crazy things happen? That’s what Make.Hack.Void is all about and this was a revelation to me. Basically, I’ve been looking for somewhere I can go to learn about simple electronics and maybe try them out on a few projects – which may seem weird to some people, but to me it just seems logical. You see, I was deprived of a crystal radio set when I was a kid. My brother got one, but I was given a sewing kit instead – which just smacks of discrimination, frankly. Anyhow, I digress. The thing is, I don’t particularly want to learn electronics on my own at home, a) because there’s nobody else into it there and b) there’s no one I can pester with questions. This is where the Hackerspace comes in – not only are there loads of interesting, proficient, curious people to ask but I might also then be able to use my skills on making an actual project. It probably won’t be as wonderfully random as a robotic hand, though you never know. Basically, in a Hackerspace you can try out ideas that cross disciplines and break open objects, systems or software, to create something new. Really, it’s about community and sharing ideas and trying to make things work and turning them into something surprising. For those interested, the best way to see if there’s a hackerspace in your area is to check the list of hackerspaces on the hackerspaces.org wiki. It’s graet to hear you’re inspired Bobby and I look forward to seeing you on Tuesday. Which reminds me; I don’t think we’ve posted the event to the website yet.